Halloooo! Recently I bought this tarte gift set Ready, Set, Glow! Skincare Kit because it has their moisturizer that I have been wanting to try. I have a combination skin type and finding a moisturizer that does not make me feel greasy has been a task. So I decided to try moisturizers that have the gel like formula which absorbs quickly and typically does not leave any residue. I decided on purchasing this tarte set because the moisturizer is $39.99 for 1.70 oz and I did not want to spend the money on a product I did not like for my skin. However this adorable set was only $16. Can you say steal? Deluxe sizes are always handy when you want to try something new and I love when Sephora starts to release these holiday sets. The other three items are just a bonus and they are all so adorably tiny. 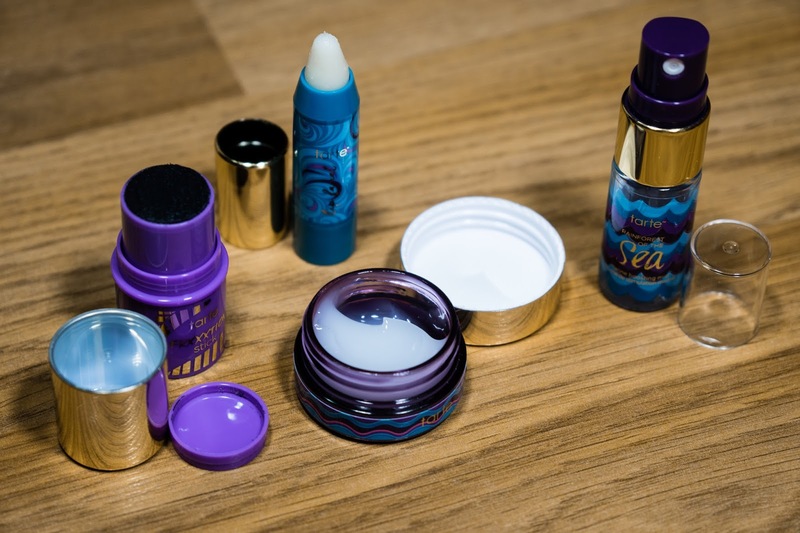 The set comes with a 0.33 oz Rainforest of the Sea Drink of H2O Hydrating Boost, a 0.24 oz Rainforest of the Sea Marine Boosting Mist, a 0.22 oz FRIXXXTION Stick Exfoliating Cleanseer, and a 0.062 ozLip Facial Lip Scrub. I have had this set for about a month now and I have some thoughts I would like to share on each product upon first impressions. 1. The Drink of H20 Hydrating Boosts claims to be a "skin quenching water gel" and it contains hyaluronic acid and tarte's Rainforest of the Sea antioxidant complex. My combination skin has dry patches along my forehead between my brows, my nose, and on my chin as well as me getting oily within my T-zone. The other parts of my face are relatively normal and this moisturizer thus far has helped my skin to feel more supple, soft, and, more importantly, hydrated. No matter what skin type you have, it is very important that you moisturize your skin. Also, I have been using this everyday and it still looks practically full. Let me tell you that a little bit goes a long way so if I do invest in the full size I know it will be a great purchase. Full size is 1.70 oz. 2. I adore facial mists and the Marine Boosting Mist has a fantastic citrus scent which is refreshing. The mist from this spray is very fine and light making it a very satisfying hydrator after makeup, after cleansing, or on a hot day. I literally will carry a facial mist with me everywhere. 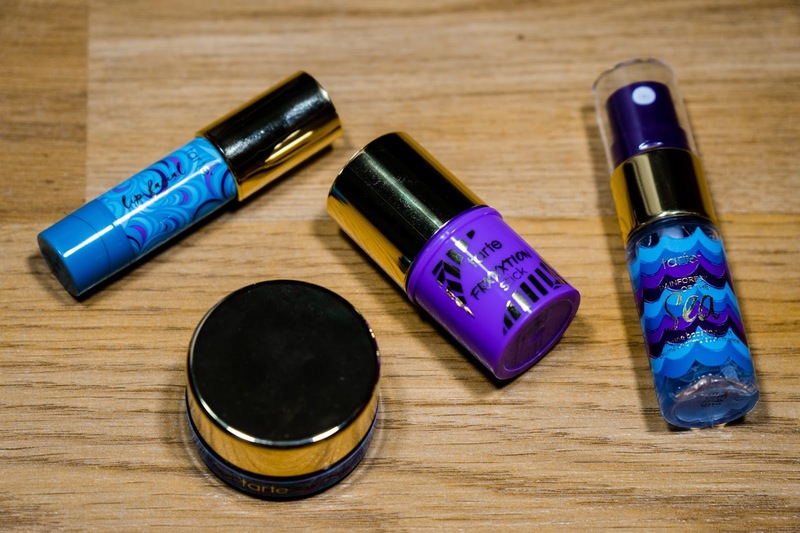 The claims made by tarte is that it will extend the wear of your makeup up to 12 hours. Now I have not tested this aspect of the mist out so I cannot attest to that but I can say it is hydrating. I have also not tried it as a primer. Hmm, I shall try that this coming week. Full size is 2.5 oz. 3. I find that the FRXXXTION exfoliating stick would be very handy for traveling. It is compact and quick and easy to use which is perfect for people on-the-go. The assertions made for this product is that it is a 3-in-1 kind of product. It can exfoliate, cleanse, and act as a face mask as well as it being great for all skin types. Also, it is Vegan! This is great for those who are looking for a vegan exfoliator and, like the moisyurizer, I believe it lasts a bit longer than you would think it could for its tiny packaging. Full size is 1 oz. 4. The Lip Facial Lip Scrub is my least favorite item in the tarte set. It is not bad, I do not hate it but it is not the greatest item ever. It's a simple lip scrub and I will give it points for convenience. It's travel friendly even in the full size because of its packaging. It is meant to condition the lips while getting rid of dead skin cells. I have tried it and it did not help the dry skin on my lips to disappear. Unless I were to continuously scrub for more than five minutes, the dead skin is still there. This is a product that will not last because it of the nature of the product. It crumbles quickly and you can easily over-exfoliate your lips with this product if it does not work for you. Full size is 0.10 oz.